Speedy the cheeky house bunny: This Bunny Blogs 4 Peace! Today is 4th November....Blog 4 Peace Day! This Bunny Blogs 4 Peace! And Please Remember to Rev up the Power of Paw for our Friend Nylablue. yes.....poor Nylablue!!! How I wish she'd get better; poor baby. and YOU, Speedy! It looks like your eye is getting better! I love your background here----so much a pirate!! Peace to you and your family Speedy. Have a marvellous Monday. I have been purring for Nylablue non-stop - and of course, I am also purring for peace today! PEACE is what the entire creation needs, isn't it? Thank you for being such a creator of fun and love, sweetness and smiles. POWER TO THE PAW and may little Nylablue heal quickly. LOVE! Me has a peaceful easy feeling today especially now that me has been visiting yous! What a beautiful day when we can all come together in Peace. Nyla and her mum are in my prayers. So proud of you, Speedy! Groovy picture Speedy! Peace to you and your family! That is a lovely globe. I am purring for Peace today and every day. We're purring for peace...today and everyday! That is very nice Speedy. I wish for peace. Sending more hugs and purrs for Nylablue. Love your psychedelic peace graphic. Speedyrabbit, you know how to blog for peace in grand style. 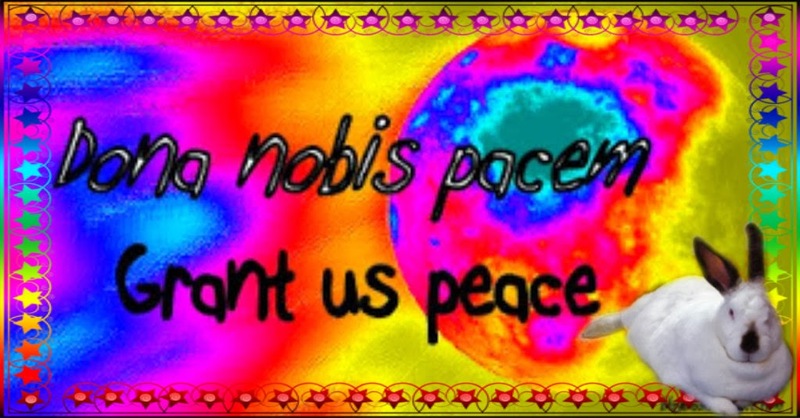 I love your peace globe and the happy vibe on this blog. I wish I could bottle that stuff!